Relax and soak up the views from this large but cosy rural cottage. When you stay with us you can simply enjoy the beautiful countryside views and walks that surround our gorgeous cottages. 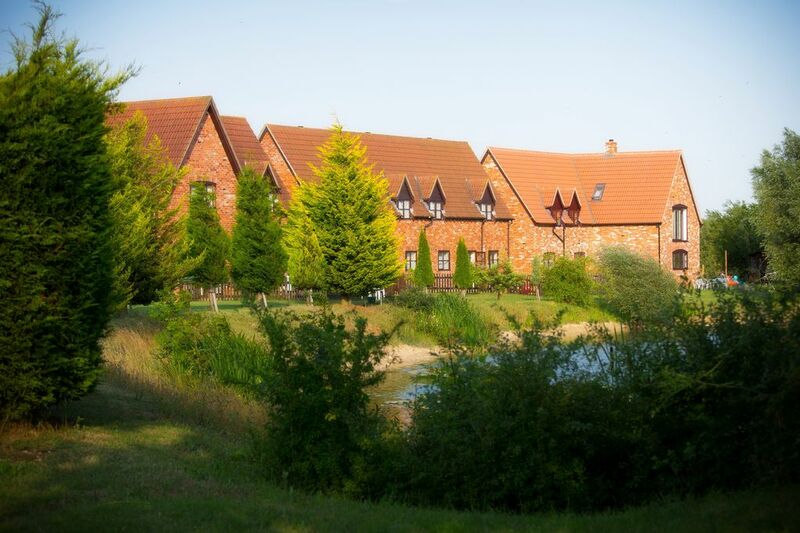 Soak up the tranquil environment while you relax in the garden and watch the sun set over the lake on your doorstep. With so many local tourist attractions you won't be disappointed - clay pigeon shooting, indoor surfing & flying, archery to name a few just under 20 minutes away. Our friendly clubhouse boasts a gorgeous little cafe (The Coffee Cup), where you can enjoy some of our scrummy homemade cakes, lunches, and freshly ground coffee - this also couples with a fully licensed bar. Other facilities available are our floodlit driving range, Golf tuition with our qualified professionals. We even have a small Pitch and Putt course – perfect for beginners, or even our FootGolf course (Golf but kicking a football!!!) which is great fun for anyone! This cottage is also perfect for those who enjoy fishing – we have 3 well stocked lakes, one of which is just a few metres from the patio doors of Clive’s Cottage. FREE WIFI, FREE and Reduced green fees on our 18-hole course Reduced golf buggy hire, Floodlit driving range, Golf tuition with our qualified Golf Professional, FootGolf/Pitch n Putt, Restaurant, Coffee Shop, Course Fishing in our 3 well stocked lakes, Fitness BootCamps onsite, Onsite Osteopaths & Sports Massage, Laundry room (tokens at clubhouse), Travel cot and extra z beds for children. Ground floor – 1 bedroom, shower room and separate 2nd shower, fully equipped kitchen/living area with oven, dishwasher, microwave, fridge, TV, Video and 1 sofa bed if required. We have an extra room which can then be made up as an extra dining area, living room or bedroom. 1st floor – 3 bedrooms, bathroom and 2nd toilet. Stunning lakeside views from your rooms and garden. Great food and drink available just a short stroll away and lots of great rural walks to enjoy. FREE golf after midday on our 18 hole golf course. (Reduced golf before midday) Reduced Buggy Hire Residents of the cottages have exclusive fishing rights immediately outside of their cottage. Heating is provided by a central Bio-mass woodchip boiler that heats the whole complex including the clubhouse. Radiators are individually thermostatically controlled. Linen is provided and changed weekly. Is available in the laundry room. Tokens can be obtained from the clubhouse. Fenced garden with patio chairs and tables overlooking the lake and 12th green. Very chill to stay and the accomodation were excelent. We are glad you enjoyed your stay with us and appreciated the lovely peaceful views of the lake and golf course. Great for a New Year catch-up with friends! Spent a lovely New Year here with 8 adults and 2 children in the party. Property was very well-equipped. Nice house. Convenient for a friends reunion. Great location for us! Brilliant sleeping accommodation living area was a little small for amount of people however with good weather garden could be used. BBQ not useable. Kitchen was well equipped with plenty of utensils, etc but could benefit from a few more mugs! Lovely cake on arrival and owners very quick to come and put in a bed that was not their on arrival. Pleased you enjoyed Ollie's Lodge. Can you tell me the problem with the BBQ? Sometimes if there is a fast turn around and the previous guests fail to say if anything gets broken it can get missed. I'm sure had you reported anything missing or not working it would have been replaced or fixed. Hope to see you again when we may have a nice conservatory added to give more living space.